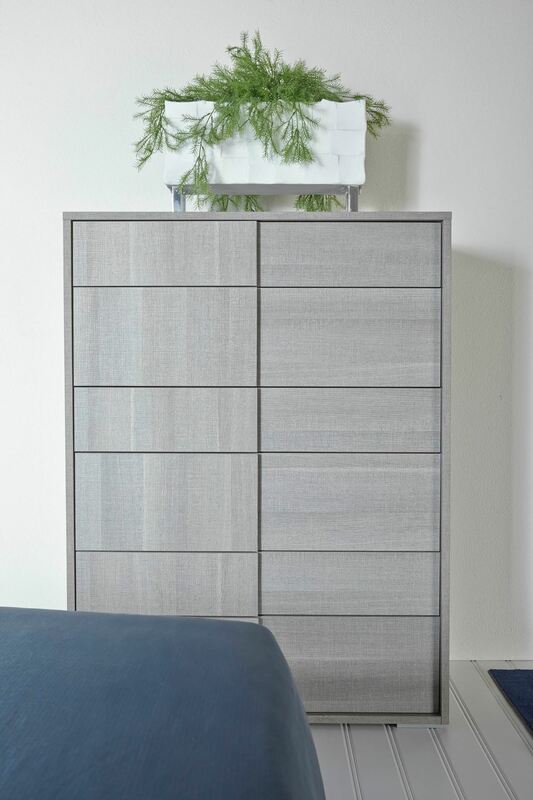 Matte Gray Oak Tall Chest of Drawers, 100% Made in Italy. Unique offset and different sized drawers provide organized storage. 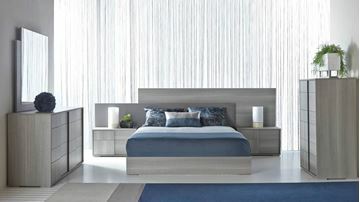 The Forte Tall Chest of Drawers is part of the Forte bedroom collection made by Star International Furniture. Drawer Interior: W: 32" D: 15" H: 4.5", 7.5"
Box 1 -- 157lbs | W:49" D:39" H:21"
Matte Gray Oak with matte gray lacquer accent, Made in Italy. The Forte bedroom collection features a unique offset headboard design. A truly sleek and modern look. Beds are available in queen, king, and california king sizes. The Forte Buffet is made in Italy by Star International Furniture. 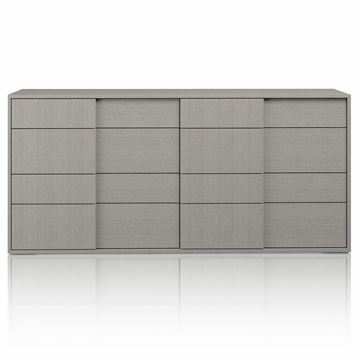 Crafted in matte gray oak, the Forte Buffet offers wonderful organized storage. A glass shelf is situated behind each soft closing door. The Forte Dining Table is an extension table crafted in matte gray oak. The table easily slide apart and the center leaf extension clips into place. Doing so opens the table to an impressive 88.5". The pedestal base is designed with a unique angle. Easily seat six without the table extended, and eight when extended. 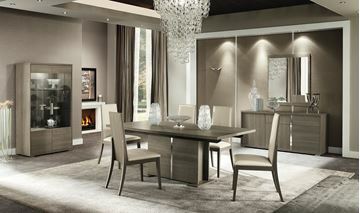 Made in Italy by Star International Furniture. Even better, the leaf extension is self storing within the confines of the dining table! 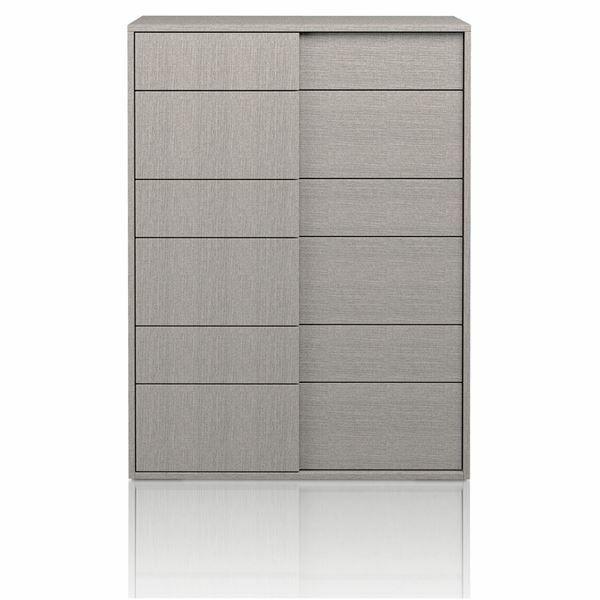 Forte Matte Gray Oak Dresser by Star International. !00% made in Italy. The Forte Dresser is part of a complete bedroom collection. A unique design, with inset and offset design elements. Offers a unique array of different sized drawers for convenience and organization. Forte Side Chair, by Star International Furniture. 100% made in Italy. The Forte showcases a beautiful tone on tone look with Cloud ecopelle on the inside seat and back, and Feather Grey ecopelle covering on the sides and outside back. 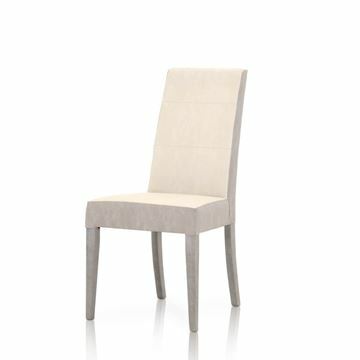 The legs are crafted in a soft tone matte grey oak finish. A beautiful design usable in many different settings. The ecopelle cover is extremely user friendly and easy to clean. 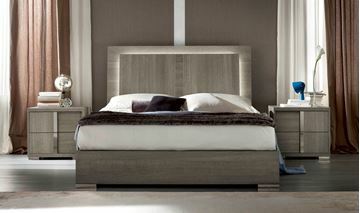 The ALF Tivoli Bed, part of the Tivoli Bedroom Collection by Alf Italia. 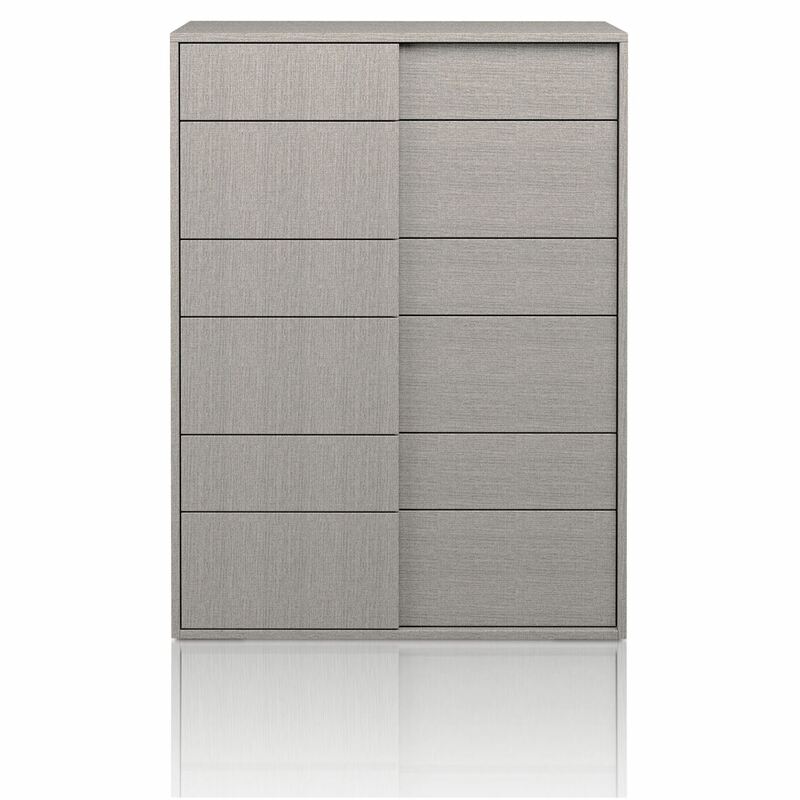 This soft contemporary design is crafted in beautiful light gray oak eco-veneer. It has a warm satin finish. LED Lights surround the raised headboard accent panel. A simpmle on/off switch is discretely located in the middle of the bed just at the height of the mattress, making operation simple at night when laying in bed. Chrome reveals and feet accent the nightstands. Soft closing drawer glides complete the attention to quality and detail by which ALF is so well known for. The Tivoli Bedroom Collection by Alf Italia. 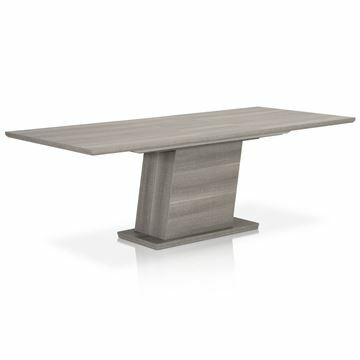 This soft contemporary design is crafted in beautiful light gray oak eco-veneer. It has a warm satin finish. The headboards feature a recessed LED light strip, creating soft accent lighting for your bedroom. Chrome pulls and feet accent the collection. Soft closing drawer glides complete the attention to quality and detail by which ALF is so well known for. 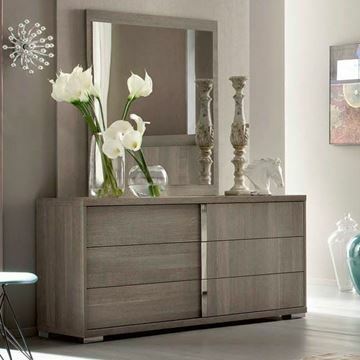 The Tivoli Dresser, part of the Tivoli Bedroom Collection by Alf Italia. Crafted in beautiful light gray oak eco-veneer. It has a warm satin finish. The drawer pulls and dresser legs are in a brilliant chrome finish. Soft closing drawer glides complete the attention to quality and detail by which ALF is so well known for. 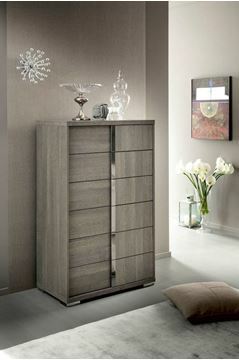 The Tivoli Tall Chest of Drawers, part of the Tivoli Bedroom Collection by Alf Italia. 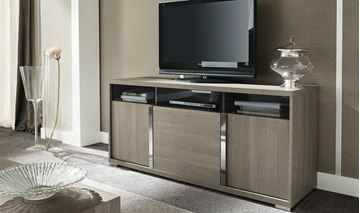 This soft contemporary design is crafted in beautiful light gray oak eco-veneer. It has a warm satin finish. 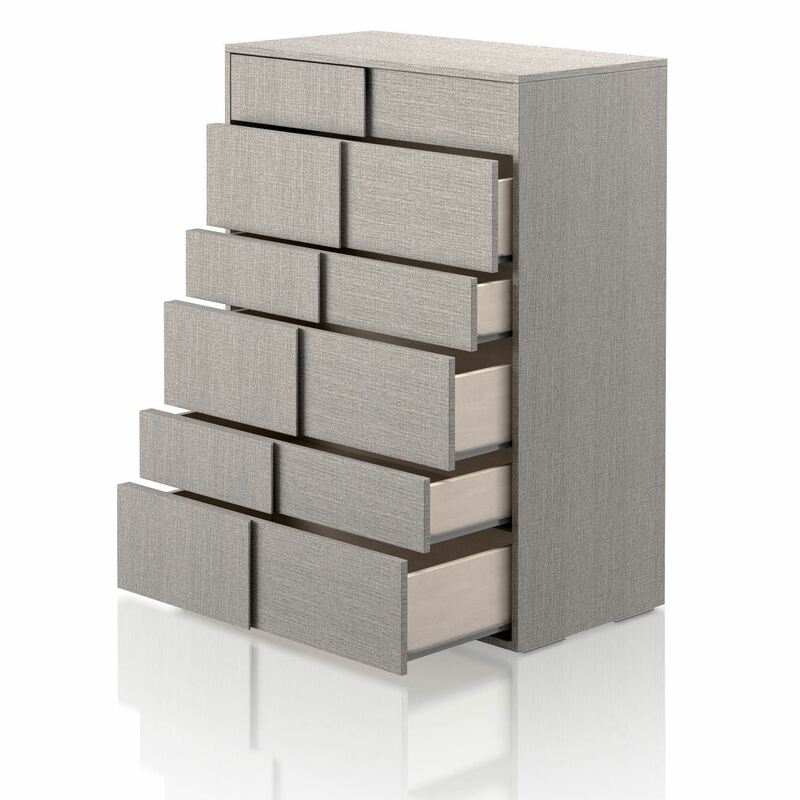 The six drawers feature chrome pulls and soft closing drawer glides. The cabinet rests atop four chrome finished legs. This piece works wonderfully as a single stand alone piece in a corner of a bedroom or next to the matching dresser. It is also a wonderful look to take two or three tall chests and align them next to each other on a wall, creating a unique look with tons of storage. The Tivol V.1 Entertainment Center by ALF Italia. 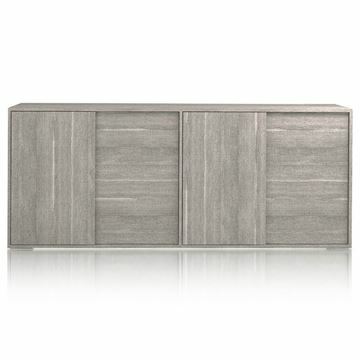 This beautiful entertainment wall is crafted in matte grey eco veneer, and accented with polished chrome door pulls. The doors feature soft closing hinges. Polished chrome legs are used for the center cabinet and side display cabinets. The center cabinet is wonderful for discrete component audio and video storage. ALF modified the door tops to be finished in dark gray glass. This design feature allows signals from remote controls to pass directly through the glass. Flat panel TV's can mount easily to the back panel, but please note that we do not supply any TV mounting brackets. 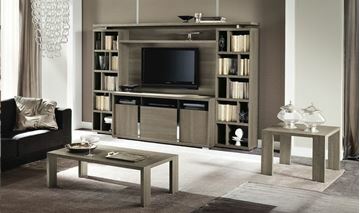 The Tivol TV Base by by ALF Italia. This beautiful entertainment cabinet is crafted in matte grey eco veneer, and accented with polished chrome door pulls and legs. The top of the cabinet is wonderful for discrete component audio and video storage. The doors feature soft closing hinges. ALF modified the door tops to be finished in dark gray glass. This design feature allows signals from remote controls to pass directly through the glass. Flat panel TV's can mount easily to the back panel, but please note that we do not supply any TV mounting brackets.